Sean here. "Sidekick" is out as a trail name since whenever I intro myself, most people think I've said "psychic" or "psycho." I'm going back to Sean until something better comes along. 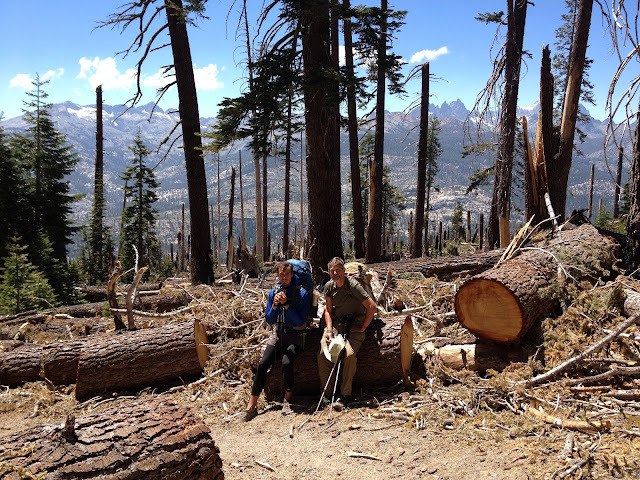 We got back on the trail today after resting and nursing Pan's swollen ankle and Dionysus's pulled groin for several days at the Motel 6 in Mammoth Lakes. It's a fave landing place for throughers and the laundry room and ice machines see a steady stream of biz. I don't think we realized the toll 11 days in the back country had on us. We were carrying a lot of weight through some tricky terrain and we paid for it physically, emotionally, and psychologically. These three elements are the legs on which any expedition depends and we came into ML wobbling. The support and camaraderie of Calf and Ruby Locks were vital in all of us finally being able to limp off the trail. ML was very good to us. We all got great massages with Barb at In Touch Spa, and the folks at Mammoth Mountaineering were most, most, MOST helpful in getting Dionysis and me set up with trekking poles. Today, my first day using them, I noticed a significant improvement in my stability and speed. If was a good way to start the second third of this journey. We passed through the significant tree blow downs around Red's Meadow. A lot of great women and men have worked long long weeks sawing and moving aside the considerable debris. 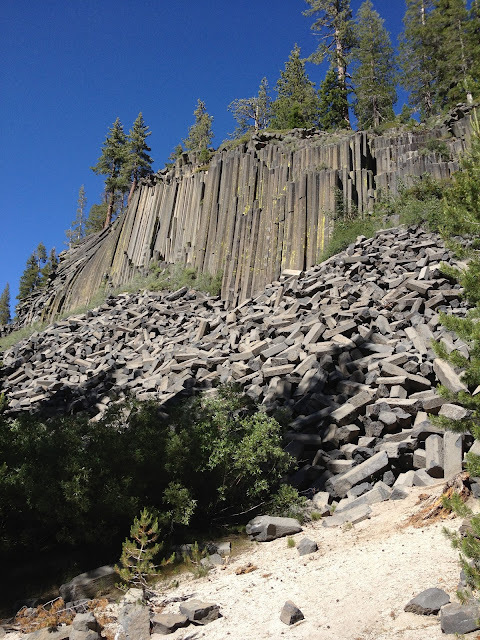 We met some of them as we hiked through Devil's Postpile National Monument. Thank you! The mosquitoes are increasing. Beauty and bugs just seem to go together up here. We stopped early, ate a good dinner, and are in the racks early. It may take a few days to reacquire a healthy, maintainable momentum. A special shout-out to my folks and sister Kate for having care packages waiting for us at ML. Mom's oatmeal raisin cookies are primo fuel for this next stretch! And what GREAT jerky, Dad!